It’s that time of year when the thrill of setting our New Year health goals starts to wear off and we are in danger of giving up on exercise. Let’s talk about how to deal with the temptation to throw in the towel, why you might be giving up on exercise, and how to make adjustments to reach your goals! 1) Your workouts are too hard. Did you take on a big goal, expecting big results, only to find yourself struggling? Consider adjusting your workouts to the fitness level you are at right now and working from there. 2) Your workout schedule does not fit into our life. Is working out in the morning harder than you thought it would be? Do you struggle to find the time after dinner? Be realistic about what your lifestyle is like right now and where you can fit your fitness in. 3) You don’t like your workouts. Are you bored, or do you just plain hate spin class? Mix it up! Try something new. Be honest about what your preferences are and then work with them. Meet with friends to make it fun or join a class or team for something new. Is there a potential injury you should see a doctor about? Is running too hard on your knees? Do not “push through the pain,” but find a way to adjust your exercise routine to allow yourself to heal, not hurt. 5) Your workouts are not balanced. You should not be doing the same thing every single day of the week. Try to vary what you do by activity and by intensity. Your schedule should absolutely include rest days and “easy” days as well as more challenging ones. 6) You are not seeing results. You may not be seeing the results you want (like on the scale), but maybe you need to adjust your thinking a bit. The scale is just one measure of your progress, and if you are putting on muscle while losing fat, it will not show much progress at all. Consider how you feel, your strength and energy levels, as well as how your clothing fits for a more accurate measure of your results. 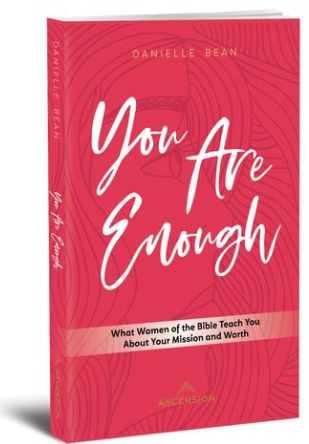 I am beginning work to record an audio version of my newest book, You Are Enough: What Women of the Bible Teach You About Your Mission and Worth. More to come! Join our all-new Girlfriends Podcast Facebook group! Check out the Catholic Momcast featuring Lisa Hendey and me, available on iTunes! Would you like to have me come to your community to speak or give my retreat, You Are Enough, based on the themes in my newest book? Get all the information here! Connect with me on Voxer!